Here at Vintage Automobilia our passion and hobby for collecting all things motoring and garage related goes back many years, having grown up surrounded by vintage vehicles and associated memorabilia in my fathers collection. From this came my own love of motoring heritage which has now grown to be a small family business. Run with help from my wife and family, we source, restore and supply items for other collectors and dealers around the world, as well as continuing to collect ourselves. Based in East Devon we travel the UK buying and selling a wide range of artefacts – Automobilia, Petroliana and other related items, those from the very early days of motoring right through to the 1980’s/90’s ‘Retro’ era. Our clients include private collectors & museums, props companies and large motoring organisations. We are also able to supply or hire items for TV/Film work and for display use and are proud to be able to offer an honest and confidential service for our clients and their collections. Please take a look on our stock pages for items currently available, we try to update them as often as possible. Our Sold page also shows some of the items we have previously supplied to customers and examples of items we can find for you. We also regularly undertake commision restoration work, particularly on petrol pumps, supplying finished items to customer specification, please feel free to contact us to discuss this further if you are considering an item for your collection. If you see something you’d like then feel free to contact us for more details. You can also follow us on Facebook, Twitter & Instagram (@V_Automobilia) where you’ll see our latest finds and projects. We also have an eBay shop, search for ‘vintage-automobilia’. Likewise, if you have any items you think we might be interested in purchasing then feel free to contact us Here. We would love to hear from you and are happy to buy individual items or complete collections. Throughout the year we can be found at shows and autojumbles too both displaying and selling Vintage Automobilia, if you see us, come and say Hello! 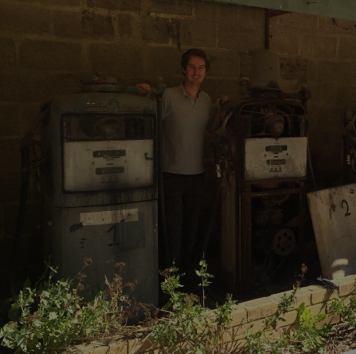 Standing with a set of four Gilbarco pumps we salvaged in 2015 from an old builders yard being cleared for development. 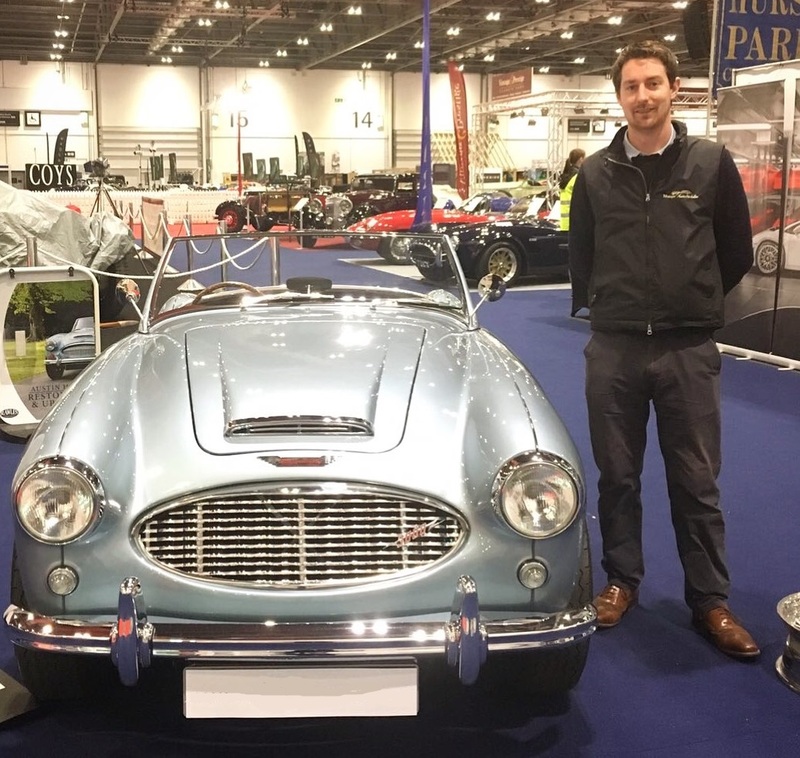 London Classic Car Show 2017 standing alongside one of the beautiful classic Austin Healey’s on display.